Welcome to Episode 41! This week’s conversation is a round table discussion with members of the teaching team at Hope Church in Fort Worth, TX. 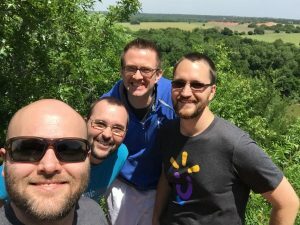 Hear what Associate Pastors, Brian Cropp, Stephen Daniel and Ben McSpadden have learned about communicating, the importance of a personal devotional life and teaming in Ministry. What have you learned about communication? What is your average prep time for a Sermon? How important is your own personal devotional life when it comes to sermon prep? What have you learned about teaming together in ministry? Join me next week for Episode 41!